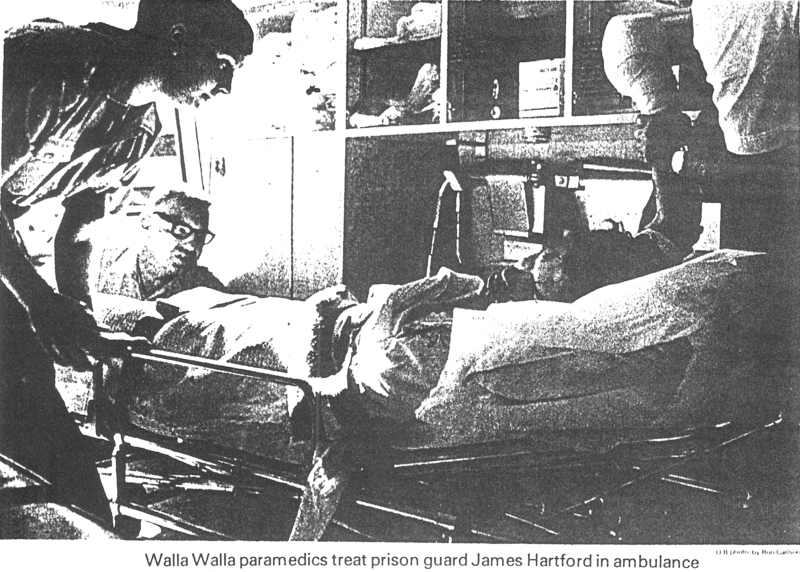 Correctional officer Jim Hartford was assigned to the Walla Walla County Courthouse on Tuesday, April 5, 1977 during the trial of two inmates charged with assault. While on break, Hartford picked up a cigarette lighter from under the table in the law library next to the courtroom. When he tested it, it exploded. It had been packed with match heads, waiting for some unsuspecting person to pick it up to see if it worked. Hartford lost most of the fingers on his right hand that day. Over the next four days there was documented retaliation by correctional officers in the segregation unit. On Sunday, April 10, 1977, inmates set fire to the chapel and ransacked the inmate store. Because it happened on Easter Sunday, it became known at the Easter Riot. The resulting lockdown lasted 46 days and resulted in dramatic changes at the penitentiary. Hartford was in the hospital for 11 days and off work for three months. When he returned to work at the penitentiary, inmates would hold up their hand in grotesque contortion and catcall him “claw.” The picture below is from a newspaper article from the Walla Walla Union-Bulletin.